What metrics matter when you’re attracting new visitors or want current visitors to view more content? Watching users, sessions, bounce rate, and session duration can show you if you’re hitting your visitor targets. These updates are conveniently highlighted with a helpful graph at the top of the Google Analytics dashboard so you can see exactly how many new visitors your site is attracting and how those visitors are behaving, if you remember to visit Google Analytics every day. 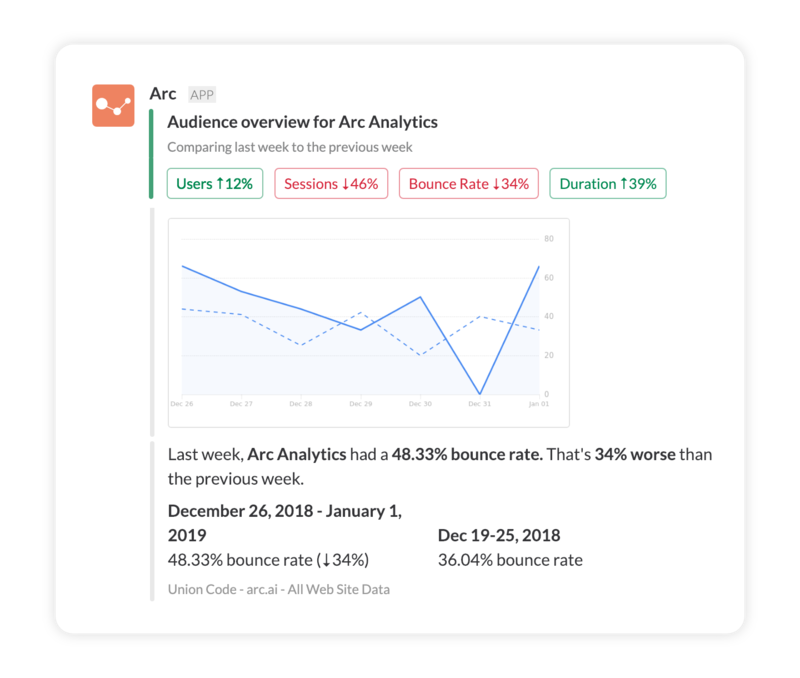 To make things easier for you and your team Arc now delivers those key audience metrics with easy to understand charts right to Slack so you can clearly see how you’re performing over the past day, week, and month! Never make another daily reminder to visit Google Analytics to look at trends and data! To set up an Audience Overview summary, log in to Arc and either add a new or edit an existing summary. Once you’ve got your Google Analytics account and Slack channel set up you can choose Audience Overview from the Shown as drop down. You should now see a preview of the new Audience Overview summary! So that’s how Arc provides the metrics you need to help you manage your site audience! Another small change with a big impact 👊.